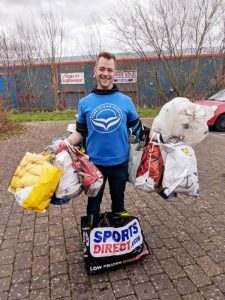 On Saturday 16th March, the Trash Tribe, a local environmental group from the charity Pure Clean Earth, took to the streets of Dereham for the second time. 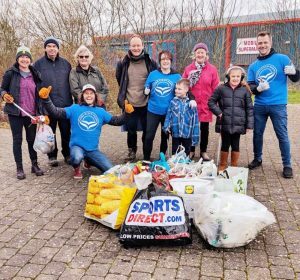 With positivity being the philosophy, the group cleared trash from the streets, the entire car park and the local games park, using equipment and bags provided by Pure Clean Earth Norfolk. In just 60 minutes with ten volunteers they collected 44.3kg in weight of rubbish that people had left on the ground. Breckland Council had also provided bins for the group who then sorted the rubbish in order to recover as many recyclables as possible. The majority of the waste involved some form of single use plastics. The Dereham community have shown great interest in this initiative to clean up our streets and footpaths. 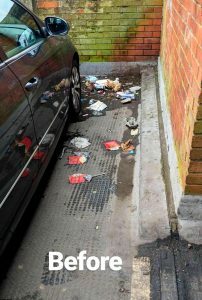 A spokesperson commented that the Breckland District Council ‘Glutton’ which visits the five market towns one day per week is not able to gobble up litter in private spaces such as privately owned car parks. The Trash Tribe’s before and after pictures show the neglected state of some of these areas. This litter-pick was organised by Dereham residents Chokolee and Robert Smith. 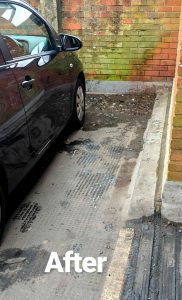 Chokolee says that she first started to notice how much litter there is lying around when her three year old daughter picked up a lolly stick and said to her that they needed to find a bin. According to Chokolee, most people do not know that there is plastic in the filters of most cigarettes and if these are flushed down the drain it eventually pollutes the ocean. She said, “Once my daughter picked up that lolly stick, I couldn’t help seeing the world through her eyes. I couldn’t not see the litter any more and I had to do something about it. That’s when she found the Pure Clean Earth initiative and joined the Norfolk group. You can join the group on facebook here: https://www.facebook.com/groups/purecleanearthnorfolk/about/ and you can post your own litter pick adventures, or talk to the organisers and get notified for the next event in Dereham town.